Vinduro is currently the growth area in classic off road riding with events run in Germany, Austria, Czech Republic, Italy, France, UK, USA and Australia. On these pages we'll be posting photos from Vinduro events out side NZ. What else would you expect but immaculately turned out riders and museum quality machinery in picture postcard landscapes? But these are not just show ponies, check out the videos and you will see that they aren't afraid to get them dirty. 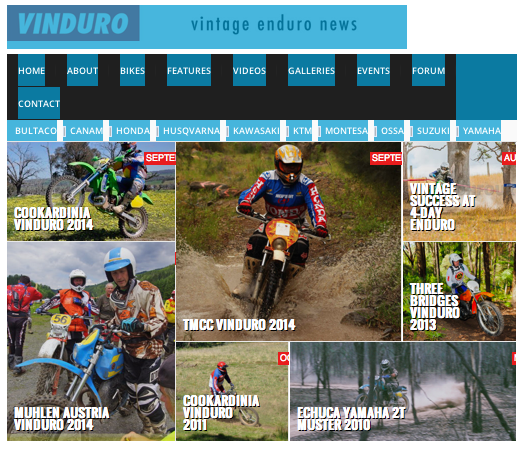 Here's a nice web site all about vintage enduros. Vinduro.com.au is an Australian web site that does an amazing job at promoting the Vinduro concept. Loads of photos from rides and plenty of model specific detail, inclusive of machines of all ages. There is a sense too that the the social aspects are also valued, like getting together with mates after a ride and enjoying a yarn around a campfire.